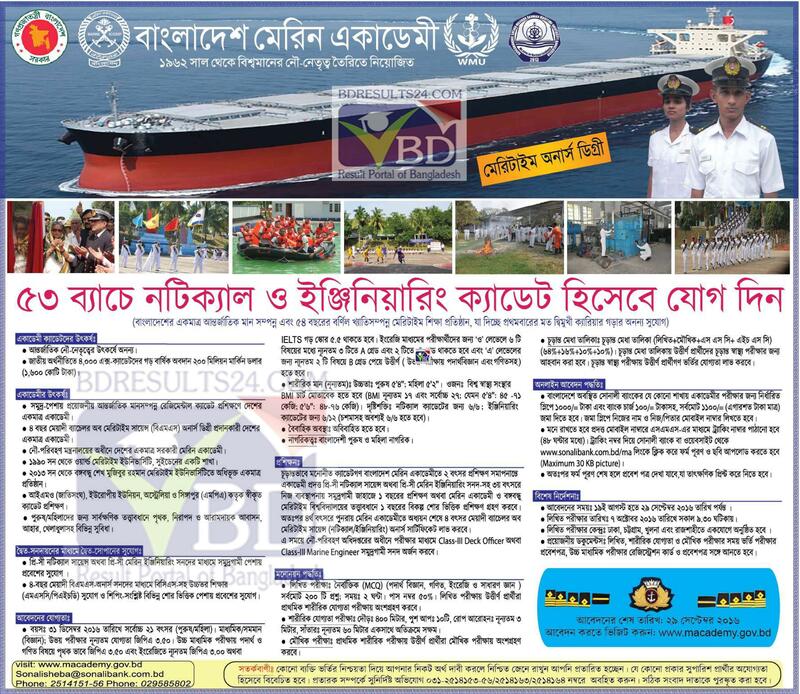 53 Batch Bangladesh Marine Academy Admission Circular & Result 2016. The Authority Declared Admission Schedule of 53 Batch Cadet Recruitment Examinations 2016 – macademy.gov.bd. Marine Academy Bangladesh (BMA) Has Been published 53 Batch Admission Circular for session 2016-2017 at Official Website and Daily Newspaper. Bangladesh Marine Academy Admission 2016: Total 275 Students will be can get Admission 2016-2017. Students have to apply online for Admission Process. Marine Academy Admission Process Complete by 3 Steps. first of all Students need to attend Written (MCQ) Exam, Then Physical Check up and finally face viva Exam. Marine Academy 53 Batch Admission Exam Seat. Age limit: Maximum 21 years on 31 December 2016. Affidavit Date of Birth will not be accepted. Foreign applicants may also apply through their respective Embassies. N.B : Final Selection will be based only on merit serial. Bangladesh Marine Academy 53 Admission apply will be start 19 August, 2016 and It will be completed 29 September, 2016. Marine Academy Written Exam Will be Held on 07 October, 2016. Marine Academy Admission circular Will be publish by Authority, Marine Academy Admission Details Circular has been Publish. Bangladesh Marine Academy Admission Written Exam Result Will be Published 13 October, 2016. When Result Published We Updated Here. Marine Academy 53 Batch Admission Result 2016.